Lois Lowry's The Giver is a cautionary tale that sets up a utopia and, through the eyes of 12 year old Jonas, slowly devolves into a dystopia in order to protect the Community's Sameness. Included in this 4 page document are chapter questions for understanding, vocabulary for comprehension, and literary device elements (allusions) to draw language arts connections to the novel. An answer key is included for your reference. Ready to print and pass out to your students with their books today! The Giver Chapter Vocabulary and Answer Key. 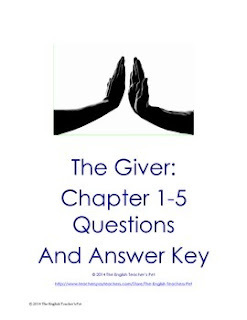 The Giver Questions, Vocabulary, Literary Elements and Answer Key.